vegetarian | "What's Cookin', Mamele?" Preheat your oven to 350 degrees. Bring a large pot of water to a boil and follow the instructions for boiling your macaroni, except that you will want to pull it out and drain it a minute or two earlier than the package says (about 7-8 minutes at a good boil). In the meantime, melt your butter in a large saucepan. Once the butter has melted, sprinkle in the flour and mix well with the butter (this part is called “making a roux”). Cook the mixture until it’s just a golden blonde colour (DO NOT WALK AWAY WHILE YOUR ROUX IS COOKING!!!! People who say a roux is hard to make are people who walked away and burnt theirs.). Add the milk and start whisking vigorously. Keep on whisking until all of the roux is dissolved in the milk. Whisk some more (but not quite as vigorously) until the mixture has thickened into a gravy-like texture (Mazel tov! You’ve made a béchamel!). Season with salt, pepper, and optional paprika. Melt in the cream cheese. Begin adding the white Cheddar about 1/4 cup at the time. Make sure each time that the cheese you’ve added is melted before you add more or you’ll end up with a big stringy ball. Next, add 1 cup of the regular Cheddar 1/4 cup at the time and then add the Parmesan. Once all the cheese has melted into the sauce, combine your drained pasta, cheese sauce, and any mix-ins (veggies, fake meat, real meat, etc.) together in a large casserole dish. Top with the remaining 1 cup of Cheddar cheese. Bake until the cheese on top is melted and bubbly (about 20-25 minutes – longer if you have mix-ins that need to heat up, just cover it with foil to keep the cheese from burning). Let cool slightly before serving because it will be like molten lava when it comes out of the oven. Enjoy! It’s hot here – like really, really, really hot. It’s too hot to slave in the kitchen all day for a hot Shabbat evening meal. I found a recipe for cold borscht on Haaretz and thought what a great alternative to the gazpachos everyone goes crazy for in the summer (especially since I have yet to be convinced that there’s a difference between gazpacho and a really good salsa). I’ve tweaked it a little since the original recipe was a little plain. You could serve this with some some grilled white fish and grilled potatoes/veggies for a complete meal. And did I mention that beets are good for you? In a pot arrange the peeled beets in water. Bring to a boil over high heat. Reduce to a simmer, cover, and cook for about 45 minutes, or until the beets are fork-tender. Remove the beets and purée. Add black pepper and lemon zest to the beets and freeze into ice cubes. Vigorously blend the salt, sugar, paprika, vinegar, and lemon juice into the remaining beet juice. Chill for at least 4 hours and serve cold. I recommend serving it in a fancy glass with the beet ice cubes mentioned above and a dollop of sour cream on top. Healthy, pretty, and great in soup! Begin by preheating your oven to 375 degrees. Next, parboil your lasagna noodles. I’ve found that even the ones that say “oven ready” really aren’t, so I would recommend throwing them in some boiling water just for a few minutes (don’t completely cook them). Drain your noodles when they’re done and set aside to cool so you can handle them in a minute. In a large skillet, heat your olive oil and then add all of your rough-chopped mushrooms. Season with salt, pepper, and garlic powder. Let the mushrooms soften. It should take about 15 minutes. 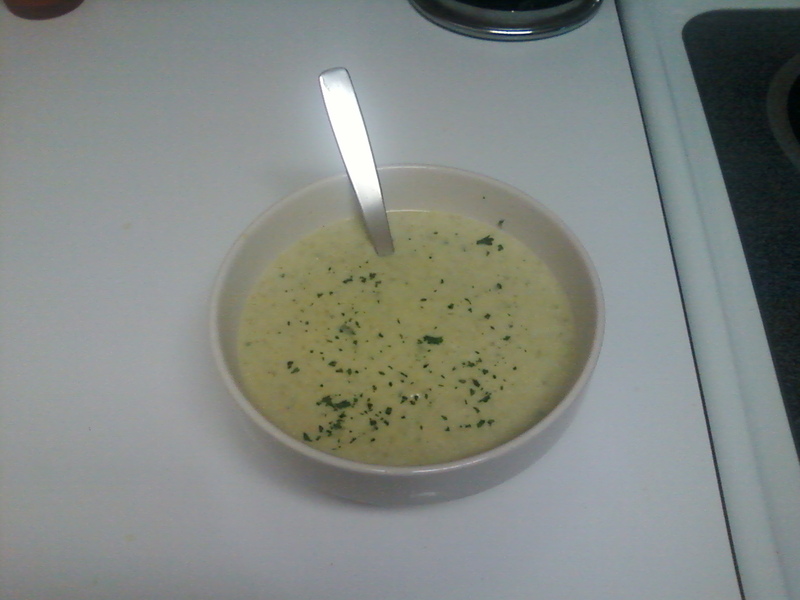 Once softened, add the Alfredo sauce and lower the heat just to keep the mixture warm. In a medium mixing bowl, combine the spinach, ricotta cheese, and red pepper flakes. 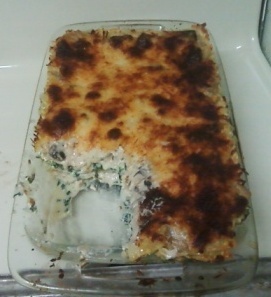 Be sure to stir well in order to evenly distribute the spinach throughout the cheese. Time to assemble! 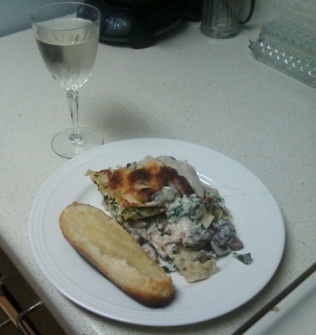 I used a 7×11″ glass baking dish, but I think this is probably flexible depending on how deep you want your lasagna and what you have handy (the glass does seem to keep the cheese from sticking better). In the bottom of the pan, make your first layer of lasagna noodles (a 7×11″ pan will take 3 noodles laid length-wise for each layer). Spread half of the ricotta mixture over the noodles carefully. 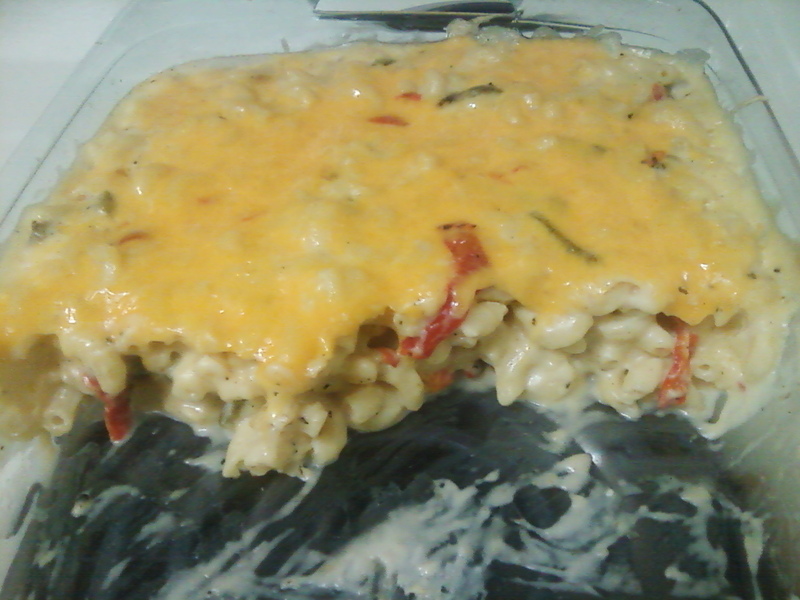 Top with 1 cup of your shredded cheese blend. Add your next layer of noodles. Spread half of the mushroom and sauce mixture over this and top with another layer of noodles. Repeat the cheese layer, add another layer of noodles, and spread on the remaining mushroom mixture. Top with the final 1/2 cup of shredded cheese. I already snagged my piece…yum! Bake for approximately 45 minutes. I like the cheese on top crusty so I didn’t cover it, but if you wanted it less brown on top, you can cover the lasagna with aluminium foil for 30 minutes and remove it for the last 15. Serve with garlic bread and a crisp white wine! Okay, now prepare yourself. These are probably the easiest enchiladas you will ever make and everyone will love them. First, preheat your oven to 350 degrees. Then, heat the olive oil in a large skillet and then add the mushrooms. Let them soften slightly and then add the sliced peppers. Once everything has softened, add the salsa and cook down until most of the liquid has evaporated. Remove from the heat. Next, get a work space ready and spread a few tablespoons (just enough to coat) of the enchilada sauce in the bottom of your casserole dish. Take a tortilla and make a line of the mushroom/pepper filling slightly to one side. Add a few olives (you could slice or chop these, but I love biting into whole olives). Sprinkle with some of the cheese (not too much). Roll up beginning with the side with filling. No need to tuck the sides while rolling unless you are using a narrow casserole dish. Repeat for all 8 tortillas placing each one in the casserole dish perpendicular to the longer sides. If it seems like they won’t all fit, cram them in. Smashing them together actually makes them better. Once all of the enchiladas are in the pan, pour the remaining enchilada sauce over the top (you may not use it all depending on the size of your pan, the dryness of your tortillas, etc…use your judgment). Sprinkle liberally with remaining cheese and put in the oven. All of the ingredients are cooked so you’re just waiting for the sauce to warm and the cheese to melt. Twenty minutes should be fine unless you like your cheese a bit more brown. Serve with sour cream, guacamole, black beans, and rice.